Rehearsals will be Monday, Tuesday & Thursday evenings until performance week. Week of performance: Monday through closing performance. Additional rehearsals may be scheduled if needed. Mags – the younger Margaret, also a bit of a troublemaker – age 15-25, female. The director will ask you to read a portion of the script and may have you do some basic acting exercises. This is a contemporary show and actors are expected to provide their own costumes following the suggestions of the director. 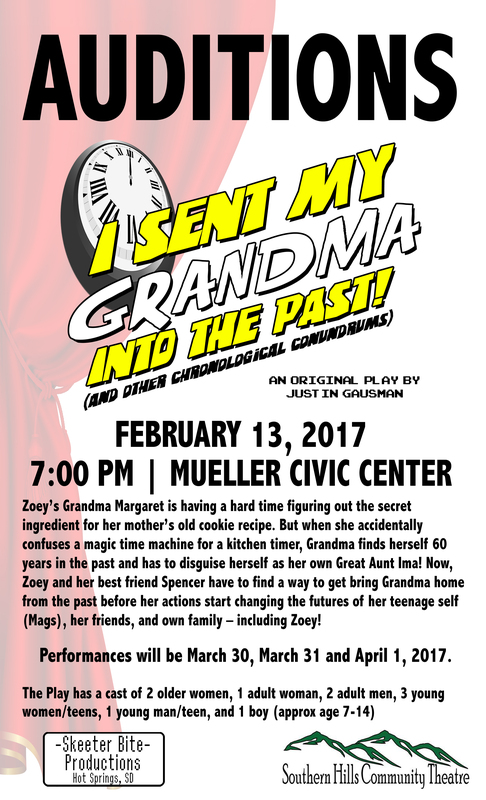 If you are interested in helping with other stage-crafts such as scenery, props, costumes, makeup, sound, lighting, directing or are more interested in serving as House manager, Box Office staff, Usher, Advertising or in other areas for this or future productions, please let Southern Hills Community Theater know. No experience? No worries! Our goal is to help folks learn about the theatrical arts as well. For these and any other inquiries, please contact shct@gwtc.net or leave a messsage at 605-745-6159 for details and they’ll get back to you as soon as they can. Next postFourth Rough Cut of Never Been to Graceland is Complete!